TVS Ntorq achieves 1 lakh sales in India. Launched just 7 months back, it has achieved this record and also is among the top 10 selling scooters in India. Its main competitors include Honda Grazia and Suzuki Burgman Street. The Ntorq gets a 124.8cc air-cooled SOHC engine. This engine churns out 9.3 BHP of power and 10.5 Nm of torque. It is the fastest accelerating scooter in its segment. It boasts of a claimed mileage figure of 95 kmph. The exhaust note of the scooter is much aggressive, adding to the sportiness of the scooter. The mileage estimated on the TVS Ntorq 125 is around 48 kmpl. It comes with a 5 Litres fuel tank, which gives a riding range of around 230 kms on a full fuel tank. It achieves 0-60 km/hr in total 9 seconds, which is the fastest in the segment. Finally, we talk about the features. It gets TVS SmartXonnect paired with a mobile app. It enables a host of first-in-segment additions to the fully digital speedometer, which boasts of 55 features including navigation assist, top speed recorder, in-built lap-timer, phone-battery strength display, last parked location assist, service reminder, trip meter and multi-ride statistic modes such as Street and Sport. Other features onboard include LED tail lights, engine kill switch, sporty graphics and decals, Roto Petal Disc Brakes and halogen headlamps. It is the most feature equipped scooter in India. 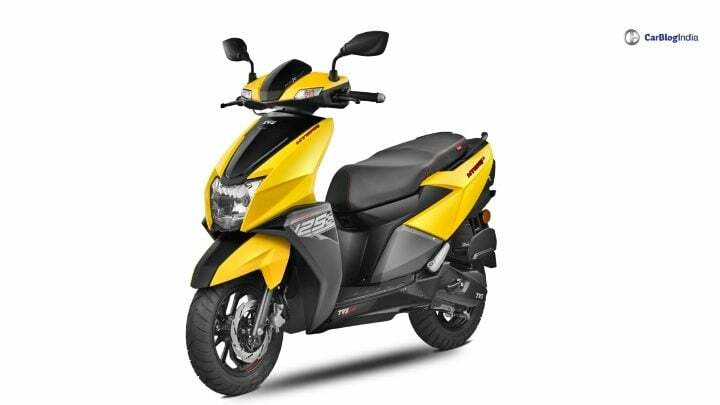 The TVS Ntorq 125 competes with the likes of Honda Grazia, Suzuki Burgman Street, Aprilia SR 125 and Vespa 125. However, the Ntorq has managed to score above the scooters which launched before than Ntorq.